Provide comfort for the family of Emily Gaines with a meaningful gesture of sympathy. Emily Pauline (Anstaett) Gaines, 91, died Monday, February 4, 2019 at Garden Valley Retirement Village in Garden City. Although she was at Garden Valley for only 2 week, she touched many hearts while she was there. She was born January 20, 1928 in Springdale, Ohio the daughter of Lawrence & Georgia Marie (Blackburn) Anstaett. Emily attended and graduated from Reeseville High School in Reeseville, Ohio in 1946. 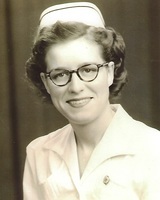 She then attended nursing school from 1947 to 1951 at Bethesda Hospital in Cincinnati, Ohio. She worked as a Registered Nurse at Christ Hospital in Cincinnati for over 50 years. She became the head nurse of the sports medicine department of surgery, and gave many seminars on sports surgery and medicine. Emily married William Gaines in 1949 and they were married for 67 years. William died on April 6, 2016. Emily is also preceded in death by her parents; 2 brothers Pat Anstaett and Charles Anstaett; and a sister Thelma Jean Gibbons. Survivors include 3 brothers Jack Anstaett of Garden City, Kansas, Orville Anstaett of Ingalls, Kansas, & Mike Anstaett of Goodland, Kansas. A graveside service will be held at the Bethel Tate Cemetery in Bethel, Ohio. There will be no calling hours. To plant a memorial tree in honor of Emily A. Gaines, please visit our Heartfelt Sympathies Store.